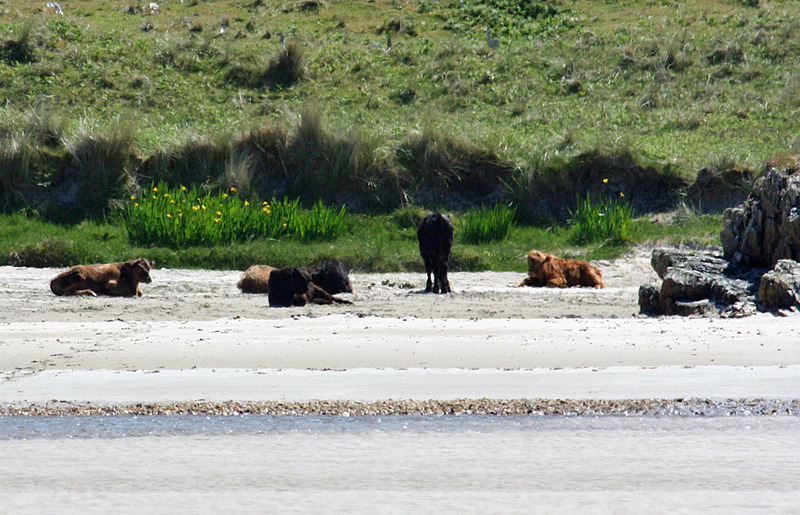 Seeing cattle on a beach isn’t unusual on Islay. These we spotted on Traigh Baile Aonghais, somewhere near Gortantaoid (I think that is probably Gortantaoid River running across the beach in the foreground). I’m not 100% sure, but I think the picture is courtesy of my sister Imke. This entry was posted in Beaches, Guest Picture, Landscape, Repost, Sunny Weather and tagged cattle, cows, Gortantaoid, Traigh Baile Aonghais by Armin Grewe. Bookmark the permalink. Nice to see some sunshine, even if it’s only on my screen. Hope the cows are safely inside today with this bad weather. I’ve got the funny feeling they were only sheltering behind the dunes, I think usually they’re out in all kinds of weather.